Each school year we are blessed to have wonderful partners who raise funds and go shopping and bring us school supplies and backpacks for every student we have! 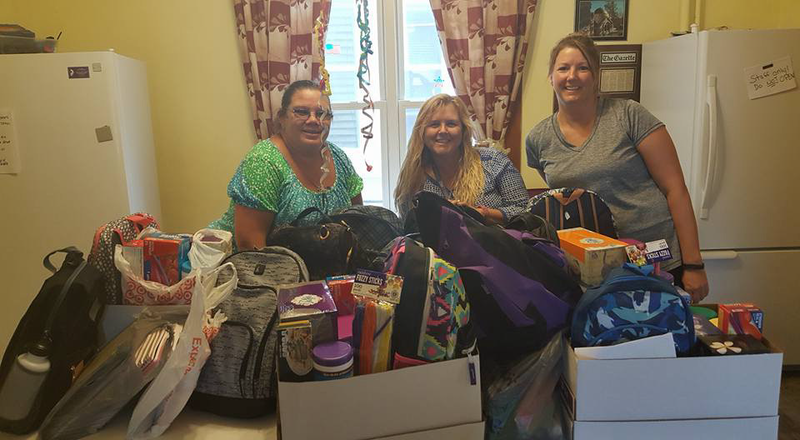 This year St. Elizabeth Ann Seton Parish, Unity Point Health and Metro Catholic Outreach helped us provide 36 backpacks full of school supplies! We had several large families who were past residents and we were able to help them as well. With the cost of school supplies topping $100 per child, our resident parents are simply not fiscally able to provide the supplies their children need. Of course the supplies did not include shoes or clothing for each student or school fees or lunches. It did provide shiny brand new school supplies and sometimes this is all it takes to give a student a great start to the new school year. I want to thank these organizations for their generous donations! With their help we are able to send our resident students back to school with confidence. They went “back to school” with smiles on their faces!